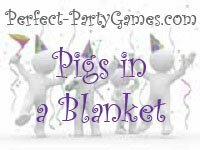 Summary: Pigs in a blanket is a game of hiding and guessing identity. Each player needs a sleeping bag. Lay out each sleeping bag on the floor. First, the group chooses someone to be the Farmer. The Farmer must then leave the room. All the other girls hide inside a sleeping bag which is NOT theirs. When all girls are hidden, the Farmer comes back into the room. She sits on one of the sleeping bags and says, "Pig's in a Blanket." The girl inside then has to say "oink, oink." The Farmer must guess who is inside the bag. If the Farmer is right, the girl inside the sleeping bag is then made the Farmer.